Moving on! I’ve been rather anxious about Thanksgiving this year, since it’s my first year braving the turkey carcass filled day as a vegetarian. It may be a delicious, melt in your mouth turkey carcass, but carcass all the same! And don’t get me started on the gravy…I love gravy. To get started on this yummy dish, you first have to make the cornbread. I simply follow the directions on the back of the Albers Yellow Corn Meal box (HERE’s a link to the recipe online) for 1 1/2 recipes, omitting the sugar, and bake according to directions (the box calls for 1 egg, so I added 2 to my recipe since you can’t really cut an egg in half!). While this is baking, sauté the onion and celery in a little olive oil until translucent, and boil the eggs. Set both aside to cool when done. 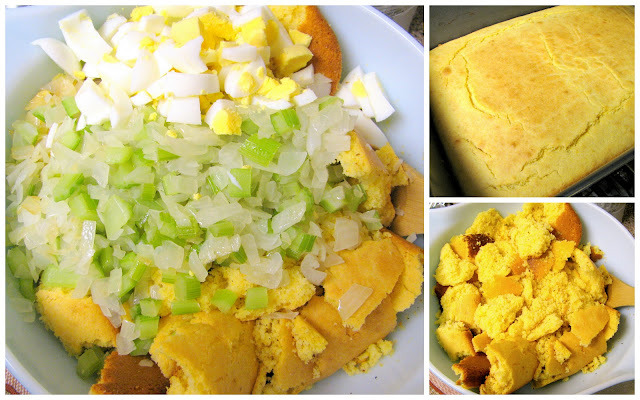 Once the cornbread is ready, break it apart into big chunks and add to a large mixing bowl along with the sautéed onions and celery, eggs, melted butter, and spices. 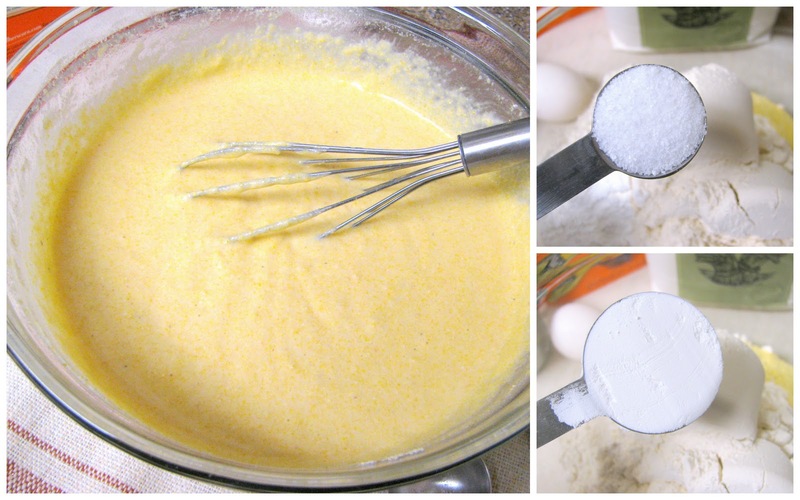 Mix together with a large spoon or with your hands (just make sure it’s cool enough to touch! ), adding the broth a little bit at a time until the mixture is moist and sticks together well. This will depend on how dry the cornbread is, so you’ll just have to eyeball it. Just make sure the mixture does not become runny. 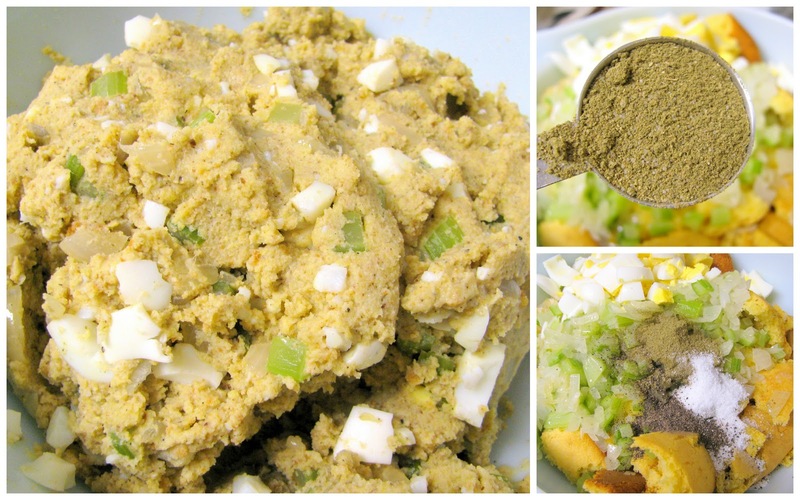 Add the mixture to a greased baking dish and bake for approx. 30 min at 350 degrees, or until the top starts to brown slightly. This has always been my favorite Thanksgiving dish. It’s full of flavor and practically melts in your mouth. It’s also lovely slathered with delicious gravy, and don’t be afraid to let it mingle with your mashed potatoes! Happy Thanksgiving, everyone! I hope that each and every one of you has something wonderful to be thankful about this year!! Thanks, Sirena! Happy Thanksgiving to you too!! As always beautifully presented recipe with awesome pictures.. Thank you, Arpit! Glad you're enjoying my blog! Simply amazing! God is great! I’d love to send a letter to the donor’s family as well. Are you able to share the address?